I've reproduced a comment I made on some concerns that blogger Pramit Singh posted on, after reading this recent Economist article. (Also, thanks, VD, for your inputs on everything below). Consumer-price inflation has risen to almost 7% well above Asia's average rate of 2.5%. What is the composition of CPI ? Besides, ask yourself, has your grocery bill sky-rocketed ? Please remember that Asia’s consumption basket will be different from India and would include electronics whose prices have been declining in India. Look at mobile bills.. they’ve crashed in the last couple of years, or at the bare minimum, you're paying less for talking more. Cars have become cheaper. The only thing that’s become more costly is petrol, which has nothing to do with Indian economics. Isn’t that good ? it indicates high capital efficiency. Btw, did you know India has among the highest ROEs in the world ? which means we’re sweating our assets better. Also remember that these capacities were built almost a decade back and if you’ve got India shining then dude, these 10-year old capacities are going to be exhausted and in need for expansion. And also have a look at the booming capital goods sector which amply demonstrates that Indian companies armed with stronger balance sheets are also seeing visible demand growth and are hence reinvesting. True, but isn’t that good for the educated because their salaries will keep rising much ahead of inflation which you already think is high ? Sure, this also has to do with the Government’s policy on education and they better do something about it. And high oil prices is a major contributor to this. Anyways, a growing economy will need more capital expenditure on machinery (as said above), some of which will need to be imported a lot of the time. The way IT revenues are growing, I think this issue will be resolved soon. The other “Asian emerging markets” have sectors like steel, mining, semi-conductor manufacturing as dominant sectors in their indexes. These sectors by definition are highly capital intensive, have low return on capital and hence trade at lower PEs. FYI, Tata Steel in India trades at 6x PE and Hindalco at 10x PE. Perhaps you could invest your money in commodities and lower the PE of your portfolio. Agree. But the wealth effect that this is creating is spurring consumption. Ask people who own property, if their spending pattern has changed as their property value increased, or at the very bare minimum are they feeling better. In the IT sector, five years into his/her job, an employee can afford a house priced at Rs50lakhs, which was unthinkable 5 years back. Affordability has increased, thanks to wage inflation (referred to above by yourself) and credit growth (ditto). I find it strange that the Economist, itself a vocal critic of the lack of transparency in China’s economic data, harps on these numbers. Anyways, China has a current account surplus but screwed efficiencies. Meaning – they just throw (invest) money into capacity creation with no caution to ROEs, etc. Ever wonder why their famous expressways, even in smaller cities, happen to be empty at times ? Does the Economist have any numbers for China’s capacity utilization in any sector ? I didn’t get your argument here. Are you saying that the growth in housing prices/share prices/bank credit should rise further or has started declining ? The following piece appeared in last week's Hafta. Comments welcome. I think Mumbai's civic polls could well be a big turning point for the city. "The primary agency responsible for urban governance in Greater Mumbai is the Municipal Corporation of Greater Mumbai (MCGM). MCGM is the most affluent and the most efficient local body in the country and one of the biggest local governments in the Asian continent. It is responsible for provision of municipal services, provision of infrastructure including public transport and supply of electricity. Its planning department is responsible for the Development Plan of the City and enforcement of the Development Control Regulations. It is not directly involved in public housing, however, it is responsible for providing basic amenities to slums, which are encroaching on its own lands or other lands within its jurisdiction." The other, and more relevant, aspect to the BMC is taking the blame for every breakdown this city has (and God knows how many of those we have everyday). Yet, Mumbai's civic polls are all set to be a major turning point for the cities fortunes, or perhaps the lack of them. For close to two decades, the BMC has been run by the Shiv Sena-Bhartiya Janata Party combine. However, with the Congress-Nationalist Congress Party Combine winning the State Elections in 2004, power over the city has been split. This is because the MMRDA – the other organization responsible for almost all conceivable infrastructure projects – is run by the Congress with the Chief Minister being the MMRDA Chairman. With opposing parties running Mumbai's largest and most important organizations, there have always been spats, face-offs and blame games between both organizations, and hence political parties, for all the ills plaguing this city. Crater filled roads ? Blame the MMRDA for digging up all the roads for the Mumbai Urban Transport Project (MUTP). Choked up drains ? Blame the BMC for not clearing the pipes before the monsoons. And so on and so forth the blame games between both organisations have continued for some time. With the Shiv Sena-BJP in disarray for a variety of reasons, the Congress-NCP combine is sensing a real chance to take over the BMC, and pretty much getting a full house for all city-related matters for the next two years (before state elections in 2008). There is also talk that both parties – the Congress and the NCP – could even contest elections on their own. Hence, both combines will try hard to make us forget those bad memories and instead focus on how these parties, through their organisations, remain, er, committed to the city. The Chief Minister, Mr. Vilasrao Deshmukh, would want us to remember all the work the MMRDA has done, including the Mumbai Metro and the MUTP. Also throw in two Prime Minister visits in the last six months to that list and Central Government approval for funding the Brimstowad drainage project. Mr. Anil Deshmukh(NCP), Minster for Public Works, wants us to remember work underway for the Bandra Worli Sealink and his approval of the Peddar Road Flyover. On its part, the BMC – and hence the SS-BJP combine – doesn't have any so many headline projects on its report card in terms of major achievements. No wonder then that recently the BMC cleared (not spent) city projects worth Rs463crores in October. This was an exponential jump over earlier months and is attributed to the fact that this kind of profligacy will not be possible once the Election Commission releases its Code of Conduct for the civic polls. In the run-up to the polls, we can also expect newspapers to be full of both parties flaunting their achievements. On the sidelines, smaller parties like Raj Thackeray’s MNS and the Samajwadi Party will largely be restricted putting up posters of their leaders and holding rallies to flay incumbents and opposition alike over the usual issues of rising prices and depressing quality of life in the city. Are there any alternatives to the above political parties ? Interestingly enough, yes. Count among these, the entry of Lok Paritran in Mumbai. Lok Paritran has held initial meetings in Mumbai in the last couple of months and is finalising strategies ahead of the civic polls. Then there is the independent Vote Mumbai campaign which is making a serious attempt at introducing an alternate urban governance system for Mumbai as a solution to its manifold ills. One suggested solution that could find takers is that of a Directly Elected Mayor, as against the current system of a Mayor who is largely ceremonial and who fills the newspapers for all the wrong reasons (for example, leading a rally to stop trains during a bandh). Indeed, Mumbaikars would do well to listen to groups such as Citizens Roundtable before exercising their franchise on January 28th 2007. Two articles in the front pages of both the Times of India and the Hindustan Times make you think about the future of Mumbai. They also give you an insight into what the politicians and builders are thinking about Mumbai. Makes me wonder whether any other class of people matter for this city. 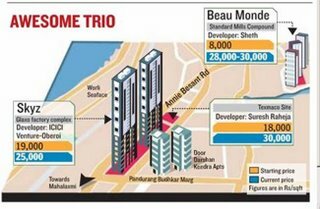 First up, the HT article (For today, this link should work, but for later go to the HT epaper site and search archives for 12th Nov), whose headlines go “8,000 sq ft flat in Worli? Skyz the limit”. Move over Bellissimo, look who just toppled you. That’s right. Skyz, a project by Oberoi Constructions, will have 65 floors, but only 44 apartments. Each will measure 8,000sqft, will be a duplex apartment spread across two floors. "We wanted a swimming pool for each apartment but the civic body turned it down as there is a water shortage in the city", explained Oberoi. Apartments will start 15 floors above the ground everyone gets a view of the sea. Of course the first question in your mind - how much ? Rs20cr per apartment. And like Bellissimo, you have to be invited to buy the apartment. And this time I hear they mean it, not like Bellissimo where your friendly neighborhood broker or home-financer could get you an invite). So I’d suggest you forget that drive down to the Glaxo compound in Worli (where the towers are being built), and don’t even think of asking anyone there to show you a sample flat. 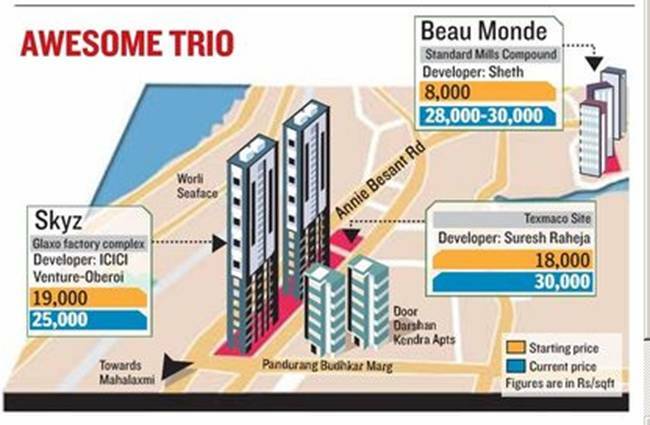 My point is anyone paying Rs20cr for this flat, or for that matter any builder investing money in this project, obviously assumes that real-estate prices in Bombay, or at least those in and around Worli (which is said to soon become the new Cuffe Parade), will only keep going up. That’s a fair assumption to make ? Next up is the Times of India, which in this article talks about the development plan (DP) for the Mumbai Metropolitan Region (MMR). This is the single most crucial document for Mumbai. It will cover planning for everything from land to transport to communications, water supply, etc. Basically a blue-print for the future development of this city. A committee of 45 members will decide on this plan. So, you’d expect some urban development experts, urban planners, architects, professionals, etc. Sure there are. But only 4, as against no less than 30 politicians. I’m guessing the rest are bureaucrats. Eminent architect and urban planner Charles Correa says he fears the entire process of drafting the regional plan may be abused. “It all depends on the relationship between these politicians and the planners on the panel,” he adds. I remember asking Chandrashekhar Prabhu about whether he believed in the idea of a CEO for Mumbai, or at the bare minimum having one agency in charge (instead of the BMCs, MMRDAs, MSRDCs, etc, etc). His answer surprised me because he said he didn't give a damn who ran the city as long as they did a good job and had a professional, approach with the involvment of urban planning experts. No such luck this time. The DP is made for a 10-15 year period and this one will cover the period 2011-2021). Yet again politicians get to decide the future of the city, which according to builders is set to be very, very rosy. I don’t know where’s the disconnect here with the present day. I mean each and every day that goes by, the words “planning” and “development” seem meaningless for this city that is just OD-ing on traffic jams, dug-up roads and crowded trains. Envy the politicians and builders – they seem to be one optimistic lot about the future of Mumbai. Pardon my skepticism then as I return to my Sunday morning coffee and reality checks. The write-up below appears in this week's Hafta. Expectations were running high from this housing policy, given the unabated rise in property prices, as well as infrastructure issues. However, the policy turned out to be toothless and a wash out. The recent draft housing policy unveiled by Maharashtra’s Chief Minister, Mr. Vilasrao Deshmukh, has raised more questions than provide answers to long-standing housing problems in Mumbai. The policy, which has been seen as a damp squib, is still in the draft stage and will now go into discussion for about two months with various bodies before becoming law. We look at a few recommendations of the policy. The recommendation that has raised the most questions pertains to land transactions now being charged on the basis of carpet area as against current industry practice of charging on the basis of built-up area. Carpet area, simply put, is the area where you can literally lay down a carpet that covers your entire flat. As against this, built-up area includes the walls and super built-up area adds lifts, staircases, entrance area, flower-beds, and anything from the builder’s creative mind that goes to increase the headline area he tells you while tempting you with that dream house. In effect, you land up paying for a whole lot of area that you do not use and probably do not own. This practice is called loading, and is typically measured by how much the built-up area exceeds the carpet area. While the accepted loading norm used to be about 25% (to cover the builder’s costs), it has steadily inched higher to 30-40%. For example, when you buy a flat with built-up are of 1,000sqft, the actual carpet area is typically about 650sqft. The Government now wants to make it mandatory for buying/selling of land to be done on a carpet area basis. With this, the Government expects property prices to fall by 30-40%, simply because it assumes that with the rate remaining the same, a lower area (i.e. the carpet area) would mean a lower price. However, after talking to a few brokers – and going by the reaction of most builders – what the industry expects more likely to happen is that property rates would in fact increase so as to keep the value of the transaction intact. So much for reform. To be fair, this proposal is being seen as a positive step, if only to increase transparency and keep a check on builders in an industry shrouded in under-handed dealings and black money. The move is also supported by home finance institutions, for example, HDFC’s Chairman Mr. Deepak Parekh has in the past called for builders to move towards carpet area based pricing of houses. The draft housing policy also includes a recommendation for builders of large projects to reserve a portion in these projects for smaller flats (400-500sqft). With this measure, the Government expects to provide affordable housing for low and middle income groups. In return for these lower-area flats, the Government will provide higher floor-space-index (FSI) to the builder. However, the policy has neither specified how much extra FSI would be provided nor how the Government would monitor implementation of this measure. Implementation would remain critical considering that builders have in the past misused similar provisions by merging low/middle income apartments group to create larger ones and then selling them off to higher-income groups . The draft policy also recommends an FSI increase from 0.5 to 1 in the extended suburbs of Mira-Bhayendar, Vasai-Virar, Thane, Navi Mumbai, etc. Interestingly enough, some time back the World Bank had met the CM and expressed interest in providing assistance of US$5billion (over 10 years) for development of Mumbai’s neighboring areas. The policy has also failed to lay down a definitive timeline for repealing the Urban Land Ceiling Act (ULCA). As discussed in an earlier Hafta piece, the repeal is a key reform process from the perspective of infrastructure funding for Mumbai under the Jawaharlal Nehra National Urban Renewal Mission. While the repeal of the Act found no mention in the policy, the Chief Minister has indicated that the matter would be taken up in the winter session of the legislature (due to begin in Nagpur on Dec 4th). Mr. Deshmukh also stated that the Government has acquired 400 hectares in Mumbai under this act in the last two years and expects release of this land to bring down property prices by 30-40%. At a time when the Government should have taken a bold and reform-oriented stance it has paid lip service and failed to tackle the issue of sky-rocketing property prices in Mumbai. Yet again, the quest for a reasonably priced house in this city of dreams remains just that – a quest for many. No wonder then, that the term “affordable housing” in this city sounds more like an oxymoron. Shivam Vij is a blogger, and a journalist, whose work I've come to admire. And that's not just because he writes well. I admire the way he chases facts and researches his stories. A few days back he reported on the atrocities against Dalits in Kherlanji. A place I'd never even heard of. He also posted some gruesome photos of the victims. There are times when I need to be shocked and horrified at the crimes that happen in the same India I'm told is shining. This was one of them and Shivam, in my opinion - and as I've commented on his blog - did a great job in reporting on this dastardly act. That's really all that matters to me. However, other bloggers questioned and protested against him putting up those gory photos of the victims. And in response to this, er, outrage Shivam has posted his defense here. Do read. For the record, and to repeat myself, I'm with him on this. And I also share Dilip's dismay. Some things just have to be said. These bloggers (Shivam and Dilip) did a great job of saying them. Update - Also read Gawker's take - I agree with him.